Click on the button below to view all the generous sponsors who have sponsored a piece of “virtual SOD” & contributed to our fundraising project so far. Please support Killarney RFC’s continued investment in its playing pitches and in our children’s future. As part of our plan to further develop our playing facilities at our base in Aghadoe, we require additional financial support, alongside the funding we have secured through sports grants and have introduced a ‘Sponsor a SOD fundraising’ project. We would like to invite all our current and past club members, supporters, and anyone connected to Killarney RFC, at home or overseas, to support this fundraising initiative. 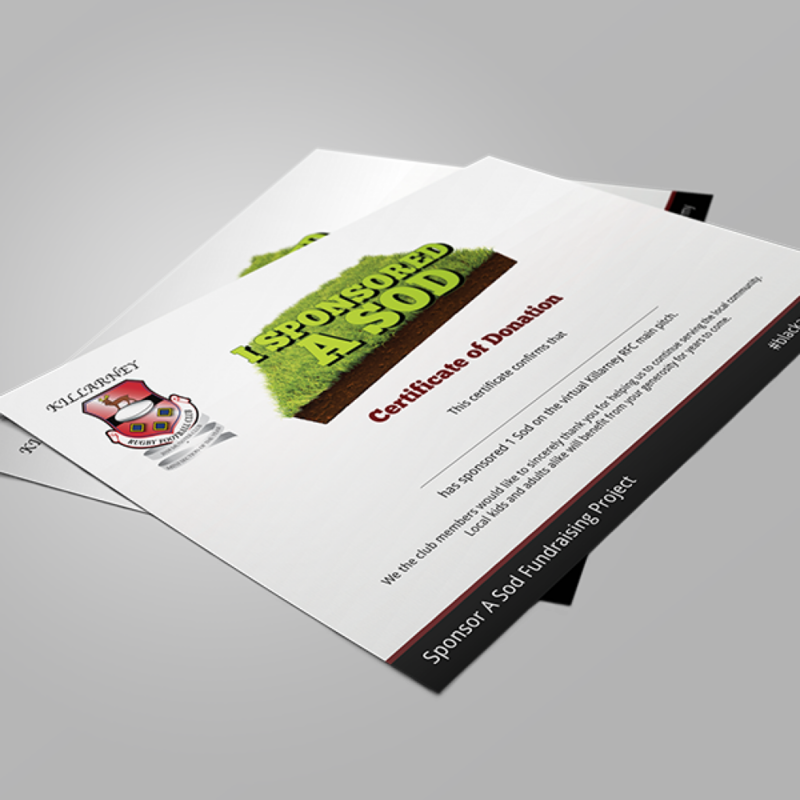 WHAT IS SPONSOR A SOD? 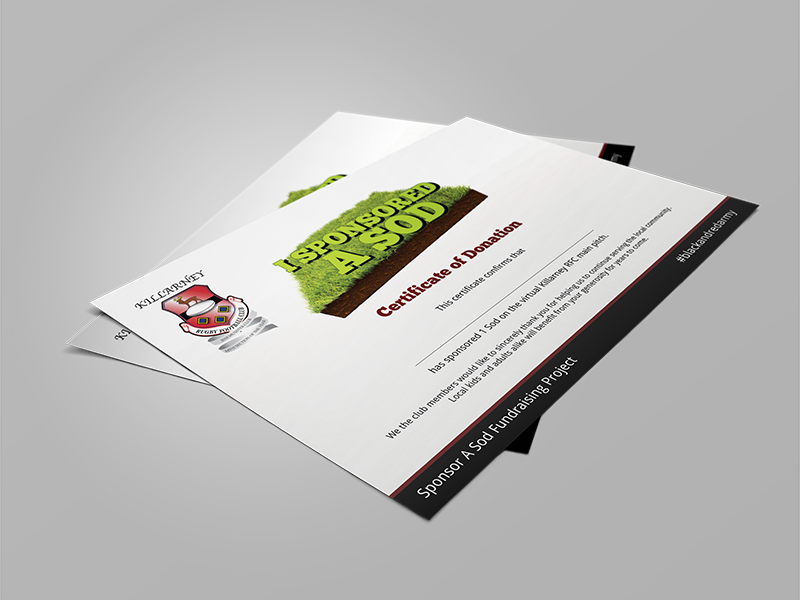 For our “Sponsor a SOD” fundraiser we will be selling 1m2 sod plots of a virtual version of our current main pitch. 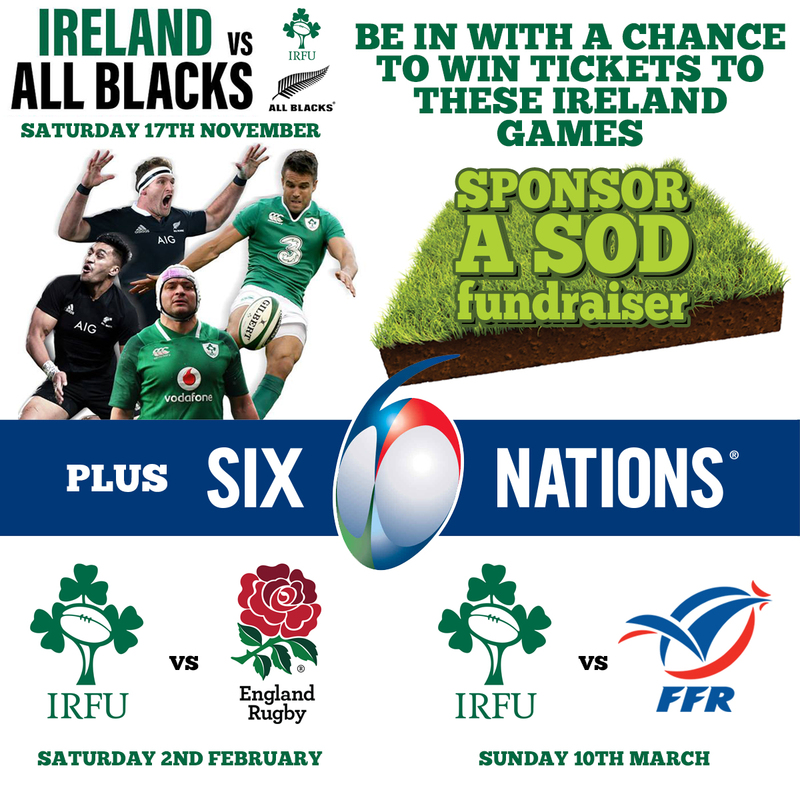 Sponsorship of each “SOD” costs €25, and multiples thereof, with the option to sponsor €100 for 5 “SODs”, and multiples thereof. Quantities of orders can be changed in the cart before checkout. SODs can be purchased from any of our club members, who are participating in our fundraising teams. Just fill out the sponsorship card and pay money due. Also any sponsorship over €250 will also trigger the Revenue’s Charitable Donation Scheme. Through this scheme, if an individual makes a donation of over €250 in the year, the club can claim a refund of tax paid on that donation by the donor, or if a company makes a donation of over €250 in the year, the company can claim a tax deduction as if the donation was a trading expense. Each sponsor will receive a piece of “virtual SOD” on this section of the website which will include your name and address, and each “SOD” will be added to this page. Sponsors will also receive a certificate of sponsorship recognising their contribution to our project. On completion of works on the pitches, all sponsors that have donated to the project will have their names listed on a special plaque which will be displayed in our current clubhouse and eventually be displayed in the new Clubhouse once completed.